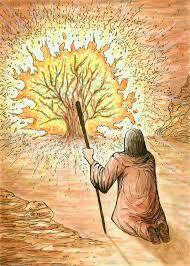 Our first reading is the well-known story of the burning bush. It catches Moses’ eye while he is tending his father-in-law’s flock. God calls to him out of the bush and identifies himself as the Hebrews’ God. Our first reading is the well-known story of the burning bush. It catches Moses’ eye while he is tending his father-in-law’s flock. God calls to him out of the bush and identifies himself as the Hebrews’ God. He has heard the cry of his people and has determined to deliver them! Moses is to go back to Egypt. He protests like all good prophets, but God has made up his mind. Who is this God? Scholars have never quite known how to translate what is said. The name of this God is mystery, four Hebrew characters: YHWH. Jews traditionally have never attempted to pronounce this “name.” It appears in the English translation of the Hebrew Scriptures as Lord. This psalm is a prayer of deliverance from one’s enemies, recognizing God as the only true help. It is a practical psalm, but one that has mystical qualities. The love between God and the psalmist is intensely emotional, a love that rivals all other loves. The name YHWH does not appear in this psalm. In this portion of 1 Corinthians 10, Paul uses incidents in the book of Numbers to teach about times of testing and the dangers of falling into idolatry. Paul’s interpretation is consistent with Jewish midrash, a method that freely uses biblical texts to form new interpretations. Passages from Numbers referred to include (in order), 11:6-9 &20:1-13 (v. 3-4); 26:65 & 14:19-20 (v.5); 11:4, 34-35 (v. 6); Exodus 32:6 (v.7); Numbers 25:1-2 (v.8), 21:5-6 (v.9); 14:2 (v.10). 10:1 I do not want you to be unaware, brothers and sisters, that our ancestors were all under the cloud, and all passed through the sea, 2 and all were baptized into Moses in the cloud and in the sea, 3 and all ate the same spiritual food, 4 and all drank the same spiritual drink. For they drank from the spiritual rock that followed them, and the rock was Christ. 5 Nevertheless, God was not pleased with most of them, and they were struck down in the wilderness. 6 Now these things occurred as examples for us, so that we might not desire evil as they did. 7 Do not become idolaters as some of them did; as it is written, “The people sat down to eat and drink, and they rose up to play.” 8 We must not indulge in sexual immorality as some of them did, and twenty-three thousand fell in a single day. 9 We must not put Christ to the test, as some of them did, and were destroyed by serpents. 10 And do not complain as some of them did, and were destroyed by the destroyer. 11 These things happened to them to serve as an example, and they were written down to instruct us, on whom the ends of the ages have come. 12 So if you think you are standing, watch out that you do not fall. 13 No testing has overtaken you that is not common to everyone. God is faithful, and he will not let you be tested beyond your strength, but with the testing he will also provide the way out so that you may be able to endure it. This passage (unique to Luke) foreshadows Jesus’ rejection in Jerusalem, to which he is traveling. Jesus responds first to Pilate’s murder of Galileans in or near the Temple and then the collapse of a tower in Jerusalem killing eighteen people. Both may be interpreted as punishment for sin. Jesus says those killed were not more or less sinful they anybody else. But, he says, “unless you repent, you will all perish as they did.” He probably means to emphasize the necessity of repentance in the face of death which could come at any time. The parable that follows softens this urgency of repentance, by suggesting the forbearance of God. The readings are taken from The New Revised Standard Version of the Bible © 1989 by The Division of Christian Education of The National Council of Churches of Christ in the U.S.A. The translation of the Psalm is from The Book of Common Prayer. Commentary on the readings is copyright © 2019, Epiphany Esources, 67 E Main St, Hornell, NY 14843, www.epiphanyesources.com. All rights reserved. Permission granted to copy for group study. Bulletin inserts are available. Go to our website for more information.